Imagine: Elon Musk, CEO of Tesla Motors and SpaceX, reclines behind a desk built out of spare rocket ship parts. A gleaming saber rests to his right. Sean Murray, founder of the independent development studio Hello Games, sits across from him, chatting about Hello's new title, No Man's Sky. There's a break in the conversation and an awkward silence threatens to stretch between the two, but then: "What do you think is the percentage chance that we're living in a simulation?" Musk asks. Murray hardly has time to answer -- he's running late for an appointment with Steven Spielberg and his communications director is getting antsy. At this rate, they won't have time to meet up with Kanye. This is the true story of E3 2015 for Murray and Hello Games. 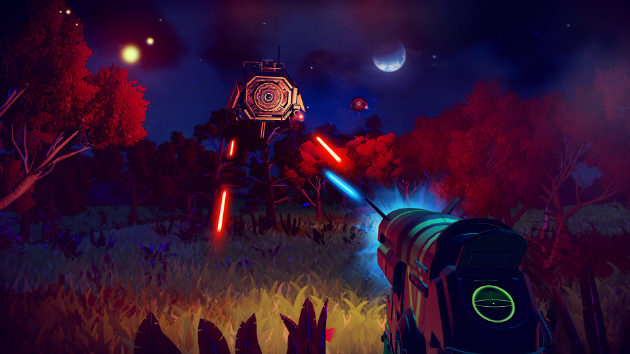 No Man's Sky claimed stratospheric fame with its announcement video during the 2013 VGX awards and again with a formal reveal during Sony's E3 2014 press conference. It's a neon-tinged, 3D, first-person exploration game on a massive, interstellar scale. No Man's Sky is "infinite," by all reasonable measures: There are 264 planets to explore, each of which features unique resources, animals, colors and landscapes. The game mimics a real-life clear night sky -- each point of light that appears on the screen is a planet or a star, most likely undiscovered by any other player, prime for exploration and mining. No Man's Sky is as mind-bogglingly big as the conceivable universe. It seems like an impossible game, one that would take billions of years for a single player to complete. Yet, so far, it fits just fine on a PlayStation 4 and it's also coming to PC. 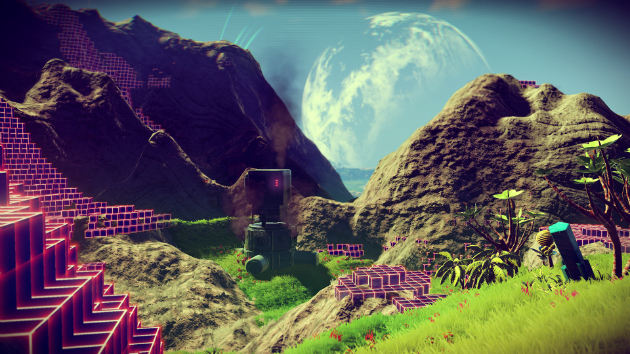 No Man's Sky is made possible through the magic of generated content: Everywhere a player goes, the game crafts the universe directly around that character. The second a player leaves an area, it disappears on a processing-power level, though you can of course return to it at any time by walking or flying back that way. It's a tricky, dense and time-consuming game to develop. "There's a reason no one is making a game like this," Murray says. I got my hands on No Man's Sky for PS4 yesterday, as part of a private guided tour provided by Murray. For a game so large, innovative and, frankly, unbelievable, it feels oddly familiar. It mimics Minecraft in terms of starting from scratch and mining a planet for resources, building on each new element to craft bigger and better weapons and gadgets. It also includes a "wanted" meter that calls in deadly robotic security forces if you murder any of the native wildlife on any planet – similar to Grand Theft Auto. And, there's something that Murray equates to a complicated Pokedex, though I like to think of it as a new kind of Hitchhiker's Guide to the Galaxy: Every creature, element, planet or cool thing that you find gets placed in a grid in your own digital encyclopedia. When you discover new items, you'll have to upload them to a Beacon to ensure they're stored for the life of your game, even if you get pummeled to death by an irate, zebra-striped slug creature with four legs and horns. I hardly scratched the surface of No Man's Sky during my 10-minute hands-on demo -- but even if I play it every day for 80 years, I'll be able to say the same thing.